I am going to diverge from the typical fishing blog to talk about some of my other hobbies today - mushroom hunting and cooking. In my opinion, both tie directly to life strategies of trying to be as self sufficient and sustainable as possible (detailed in a previous blog). Cooking is something I have loved since I was young - particularly after I got my first apartment when in college. Now it is a great way for me to relax after work while experimenting with new flavors and ideas. There is a certain challenge in making a good meal - the timing, temperature, prep, etc. that I absolutely love. Mushroom hunting is a fairly new hobby for me and I consider myself a total novice. Last year during hunting I season, I was seeing a ton of mushrooms on our property. I had done some morel hunting over the years, but I wanted to learn more about southern mushrooms and hopefully find some that were edible. It turns out, we have a very healthy population of chanterelle mushrooms in our back yard and they are loving this rainy spring. The result has been some extremely delicious meals! My first chanterelle hunt came about unexpectedly. I was in the woods behind the house cutting up a downed maple tree for a BBQ we were doing (more on that later) and noticed some orange mushrooms about 15 yards away. I went over to get a closer look and noticed that they looked a lot like the chanterelles that someone had posted a picutre of on the NC Mushroom Hunters Group the night before. I went inside, grabbed my 'Field Guide to Southern Mushrooms', and flipped to Cantharellus cibarius. They certainly looked legit, particularly because of the false gills. But I wanted to be 100% sure as I tend to be overly paranoid about eating wilding mushrooms. A Google search yielded two look-a-likes - the jack-o-lantern and false chanterelle. The major difference is that both of those species have true gills. I have also found that the jack-o-lanterns tend to have more of a sheen to the cap and the false chanterelles, at least right now, are much duller in color with distinctly tan outter caps. Another good indicator is that chanterelles will not grow directly on wood (live or decaying), but the other two species will. I went back outside and snapped a few photos. I emailed one to an experienced mushroom hunting friend and loaded another to the NC Mushroom Hunters Group on Facebook. Within minutes, it was confirmed that I had found a patch of golden chanterelles. I went back inside, grabbed an onion sack, and started combing the woods. The mixed hardwoods, mainly oak, that make up our back yard had pods of chanterelles scattered throughout - most at the top of small drainage paths on a gently sloping hillside. I found both jack-o-lanterns and false chanterelles too, as well as many other types of mushrooms that I could not identify. Within a half hour, I had a bag full of about three pounds of chanterelles and was chomping at the bit to come up with some recipes. That night, I decided I would clean about a pound to saute over some chicken breasts for dinner. I trimmed the stalks, washed them thoroughly, and heated a small amount of butter in a cast-iron skillet. Combined with a little salt and pepper, they were absolutely delicious! 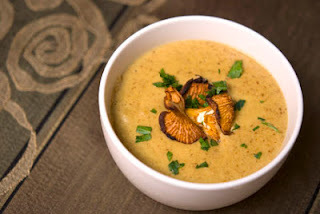 Note that the original recipe calls for 1 pound of mushrooms rather than 2, shallots instead of the sweet onion, heavy cream instead of light, brandy instead of apple brandy, saffron instead of tumeric, and 3 tablespoons more butter. I used light cream and less butter to make it healthier. I used the sweet onion because the store was out of shallots. I used tumeric because folks online said it was on OK substitute for saffron, which we did not have and very rarely use. The apple brandy was already in the fridge and I suspected the sweetness would be nice in the soup (I was right). Make the veloute. Heat the stock to a bare simmer. In another pot, heat the butter until frothing and stir in the flour. Stirring all the while, let this cook for a few minutes over medium heat. Do not let it brown. Whisk the hot stock into the roux and let this simmer for 14-20 minutes, stirring often. You want it to slowly cook down by at least 1/3 and be silky looking. While the veloute is simmering, make the mushroom base. Mince the mushrooms and onions fine and sweat them in a saute pan over medium heat with a 1 tablespoon of butter and a touch of salt. Cook, stirring often, until the onion is translucent and the mushrooms give up their water. Do not drain. Crumble the tumeric into the brandy and add it to the mushroom base. Turn the heat up to high and toss or stir to combine. Cook until the brandy is nearly gone. Buzz the mushroom base into a puree in a food processor. When the veloute is ready, add the mushroom puree and stir well to combine. Cook this at a bare simmer for 8-10 minutes. Beat together the egg yolks and cream, then ladle — a little at a time — some soup base into the egg-cream mixture. This is called a liaison, and you are tempering the eggs with the hot stock slowly, so they do not congeal. Once you have 3-4 ladles of soup into egg-cream mixture, pour it all back into the soup and simmer. DO NOT BOIL. Simmer for 2-4 minutes then remove from heat and serve. I neglected to take a picture of my soup, but I promised it looked even better. This one is taken from the 'Hunter, Angler, Gardener, Cook' blog via Holly A. Heyser. This soup was extremely good and would have been even better with some bread to soak it up (stupid diet). We did break the diet a little and paired it with a glass of white wine, which was a great compliment to the flavors of the soup. This past weekend, Mary May and I took a break to search for some more chanterelles. We found another one or two pounds and immediately I began recipe searching. I stumbled upon one that sounded easy and delicious, so next on the menu was a chanterelle and fontina frittata. I used dried tarragon, which was underwhelming. I strongly suggest using fresh to get the full effect. I also cut the amount of olive oil in half, upped the amount of mushrooms by about a pound, and substituted Gouda for Fontina as was recommended online. I also forgot to take a picture of the fresh frittata, but I did get a shot of the day old leftovers! Preheat the oven to 350°. In a medium bowl, beat the eggs with the chopped tarragon. In a large, nonstick ovenproof skillet, heat 1 tablespoon of the olive oil until shimmering. Add the chanterelle mushrooms, season with a pinch of salt and pepper and cook them over moderately high heat, stirring occasionally, until the mushrooms are browned, about 8 minutes. Add the remaining 1 tablespoon of olive oil to the skillet. Add the beaten eggs and cook until they begin to set at the edges, about 30 seconds. Using a spatula, lift the edge and tilt the pan, allowing the uncooked eggs to seep underneath. Cook until the bottom is set, about 3 minutes. Sprinkle the cheese on top and bake the frittata for about 8 minutes, until fluffy and set. Slide the frittata onto a platter, cut into wedges and serve. The frittata made another delicious wild mushroom dinner - although it could have been an equally great breakfast. The Gouda cheese was a nice, subtle compliment to the rest of the dish and the mushrooms really shined. Next time I might add some cherry or grape tomatoes from the garden as well. Hopefully we get a little more rain this week, so we can go on the hunt for more chanterelles again this weekend. Before I wrap this up, I mentioned finding my first chanterelles randomly, while cutting wood for a BBQ. Well, Sunday I took my in-ground BBQ pit for a test drive. The result - deliciousness! That story will be posted later this week. Until then, tight lines! Haha, I know it! One more fancy item and I would have been in over my head. YUM!Makes me want to head to the woods I have never picked anything but morrels but will have to do some research. I had only ever done morel hunting before this year as well and my ID skills have a long way to go. Unfortunately, our land just is not conducive to growing morels and I had little luck looking in other places here in central NC this year too. Maybe next year. Happy hunting! I am a fan of mushrooms and love eating them in a lot of dishes. I can't help but remember the movie with Clint Eastwood in it "The Beguiled" when I eat mushrooms. I don't know if you have seen this movie or not but mushrooms played a major part in the movie. It is a Western by the way, if you haven't seen it --rent it great movie. Back to the post, I am going to get my wife to prepared some of these dishes--thanks for sharing a great post!! Bill, I am a big Eastwood fan and have seen most of his westerns, but "The Beguiled" has somehow escaped my viewing pleasure. I will put it on the list for sure. I hope you enjoy the recipes! The Preparing foods Planit some excellent dishes but what I like best is their record function and preparing training. This will secured me projects and disappointment.